After a morning spent working the sheep. It's a slow process. . . Since there's basically a buffet on the way. 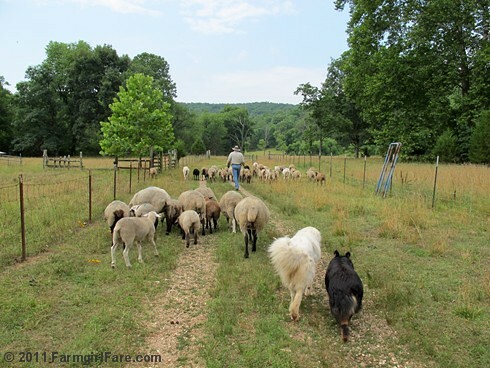 Notice how quickly the shepherd guy and the pace donkey ended up ahead of the flock? It always helps to have somebody—preferably the one carrying the camera—prodding the stragglers along and bringing up the rear. Want to see more woollies? You'll find all the sheep photos posted so far this year here. And that cute overload known as lambing season can be found right here. 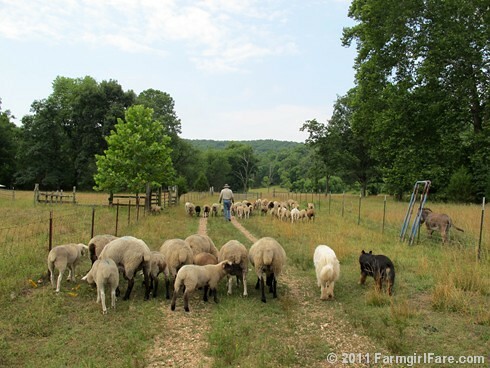 © 2011 FarmgirlFare.com, putting one hoof in front of the other—eventually. The best way I've found to get the sheep to move (if you're not holding a treat bucket)? Stand behind them and clap your hands—although visitors do tend to look at you a little funny when you start applauding the animals. Maybe there's a lot of interesting 'stuff' to investigate so it slows them down. OK, you have 4 dogs, but the photographer has to do the work? I love spotting the dogs in between the sheep! Does Buddy Bear not herd the sheep? Too much good stuff to eat on the way! What beautiful picture's of the sheep grazing. I love the scenery, and the dogs seem to be enjoying themselves also. Tuesday Dose of Cute: Peep! Peep!